I’m anxiously awaiting a couple of new releases by some favourite bands here in Spring 2014, but as I do so, let me introduce you to another favourite and one of rock and roll’s greatest travesties: that fact that New Zealand’s Mutton Birds were not a wildly popular mega-success. In a fair universe, each member would have a giant eco-mansion perched on the highest peaks of the South Island. Instead their greatness is appreciated only by aficionados of great, creative and meaningful pop music, such as myself (ahem). 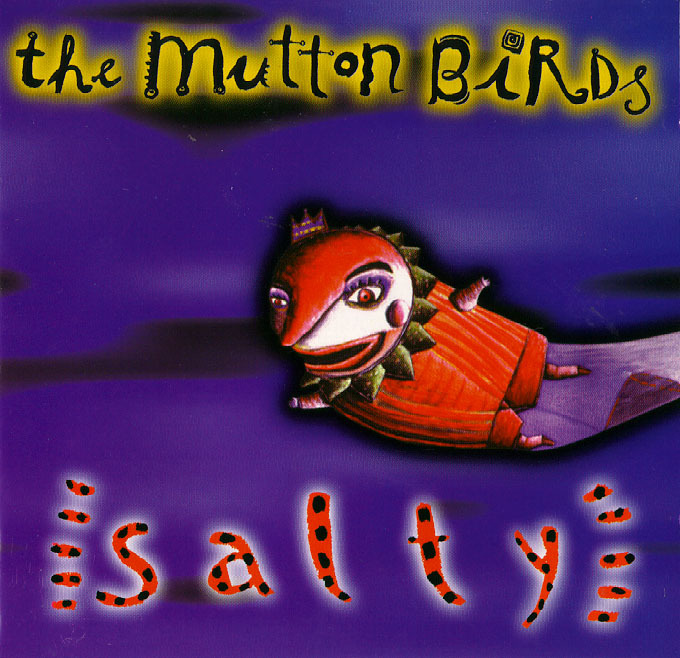 Who were these curiously named Mutton Birds, and why was this band so legendarily great? Well, the short answer to question two is the songwriting, though there was much more to the Mutton Birds sound. To answer question 1, Don McGlashan is a longtime mainstay of the New Zealand rock scene, having been in Blam Blam Blam and having played a formative role in the development of a distinctive Kiwi pop sound. McGlashan was the band’s guiding light, but bassist Alan Gregg also contributed with his own clever, mostly lighthearted songs, and original axeman David Long was an excellent off-kilter experimental musician moonlighting as a rock axeman (I saw him use a real Theremin at a gig once). Oh, and McGlashan also was known to take euphonium (a little tuba) solos. OK, this might sound like a good band, but what else? Yes, it’s the songwriting. 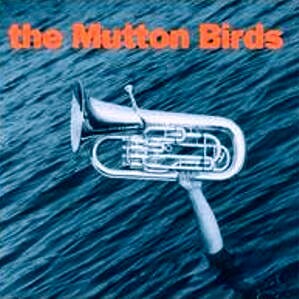 The Mutton Birds released their first album in 1992. I was introduced to their music when I was reviewing CDs for my university paper. We had a good scam going wherein EMI sent us basically all their product, and we’d review a couple of things per month. The rest we’d either keep or sell for booze money. 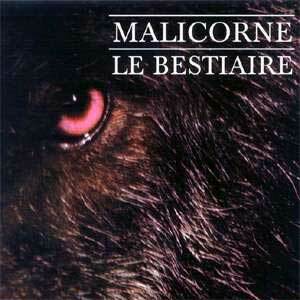 On day we received a CD with odd cover art by a band with a strange name. The album was Salty, the band’s second album and first international release. The big idea, I assume, was that EMI could have another Crowded House on its hands. 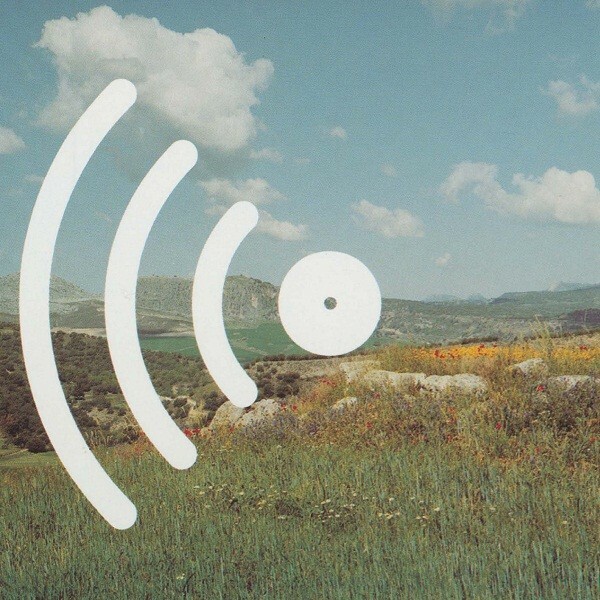 From note 1, this album hooked my young ears with a song titled “The Heater”, about a platonic love affair between a man and his electric heater (“Come on and plug me in”). OK, plenty odd, but eccentricity wasn’t McGlashan’s only calling card. The lovely emotional sentiments of the yearning “In My Room” and “Anchor Me” showed a top-notch lyrical and melodic talent in full flight. Every song on Salty is a classic. However, it’s that album’s follow-up, Envy of Angels, that is the defining collection by this wonderful band. See below. The difference between songwriting greatness and just regular stuff is not necessarily easy to define. Suffice it to say while most writers churn out stereotypical sentiments and standard melodies, those with a rare gift can crack open your mind or your heart with a simple phrase or a well-placed harmony. McGlashan’s work is replete with such moments, such as when on “Like This Train” he gently intones “The power lines are dancing overhead/The wind is shaking up the trees” and I can feel the mystical moment he describes. This is the power of a true poet’s talent. 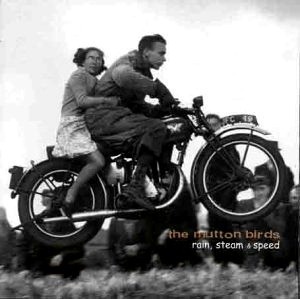 After somehow not becoming the stars that EMI had projected, The Mutton Birds independently released Rain, Steam and Speed, another fine collection, before riding off into the sunset. 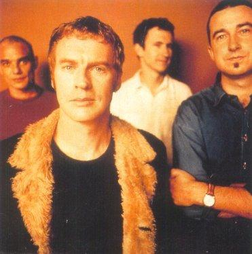 Band members went on to new projects, McGlashan releasing a solo album and touring as part of Neil Finn’s band, while Gregg founded a band called Marshmallow. 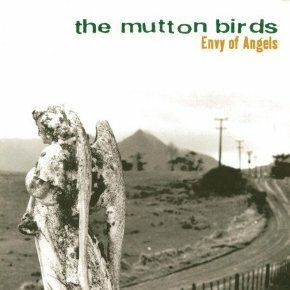 To me The Mutton Birds have a special resonance from my wasted youth, when their songs were the soundtrack to my slowllllly developing life and musical tastes. But revisiting these albums now, I find the transcendent talent shines through as brightly as it did in 1994. You owe it to The Mutton Birds and to yourself to check out this band, if you love great, moving songs. The Mutton Birds’ first album as the new Kiwi supergroup is a solid collection that gives some hints of the greatness that will be revealed on the second and third albums. The overall sound and direction is very much in the brittle, stripped-back tradition of eighties Kiwi pop, not as raucous as The Clean or as deliberately unpolished as The Bats, but still very down-to-earth. McGlashan’s gift for unorthodox lyrics and imagery shine through on “Giant Friend” and his melodic talents are quite evident on the rather catchy “Dominion Road“. There’s definitely something in the cultural isolation of New Zealand that has produced a nifty strain of intelligent pop. Confidence buoyed, McGlashan and co. unveil a lengthy collection of twisted south seas folk-rock. The aforementioned “The Heater” is based around a snaky guitar/bassline and a couple of euphonium solos (that McGlashan eccentricity). Again, insanely catchy, and it contains the immortal lyric: “Although my body is rusting through/I have carried this song for you…It’s from the Sphinx and the Serpent too/So plug me in”. But man, the clever gems just come one after the other, from the missing-you Kiwi-style numbers “Ngaire” and “You Will Return” to an agoraphobic’s lonely pop lament on “In My Room” (“In my room I have built a religion of a kind/I’ve found virtue in things that stay the same”), a cute tribute to hometown “Wellington” and the plaintive cry for love that is “Anchor Me“, what we have here is one of the best pop albums ever recorded. EVER. McGlashan is ably supported by Long’s sneaky guitar parts and Gregg’s sweet harmony vocals. This album sort of changed my musical life a bit. Presumably EMI agreed with this quality assessment, because they put a big push on for this next album, which is if anything even better than Salty. A more polished collection with the weirdness dialled back a touch, Envy of Angels is a collection of adult pop songs that contain myriad enlightening and moving moments. The ultra-sweet pop of “April” and “Come Around” is nice, but it’s in the mid-tempo numbers that McGlashan really pulls at our heartstrings, songs such as “Like This Train” and “While You Sleep“, a series of little vignettes of a quiet, loving life with such vivid lines as “Once on a still, grey motorway day/We jumped the green fence and we lay/Watching all the expensive people speeding away”. 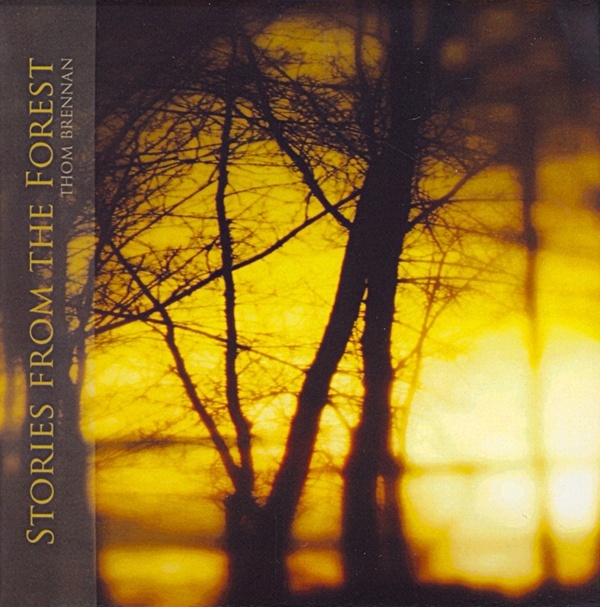 “She’s Been Talking“, a misty tale of requited smalltown love, also contains some incredible imagery, as does the elegant closing title track, a love letter to the landscape of home. You have to know what’s under your feet “so you can make things strong enough/to take the weight/the weight of all the people/who haven’t been born.” The supreme harmonic richness of these songs is also manna for the ears. This is an essential album. It seems that the push to break the Mutton Birds was short-lived and took its toll, but the band members, who had moved to the UK, gamely forged on for one more self-released album with a new axeman. This actually resembles the first album more than the last two, a stripped-back, muscular set of expert pop. There are several memorable and hummable numbers such as “Pulled Along By Love” (if I were a rock critic I’d probably have pulled out that old chestnut, “propulsive”, to describe it) and “As Close as This“. This album has not made as great an impact on me — I don’t find the writing as overpoweringly transcendent as on the previous recordings, so I consider it non-essential. Those wishing to investigate McGlashan’s writing further would do better to check out his more recent solo albums (see his site below). A very fine summary of a worthy musical collective. Thanks! Someone had to do it!